It’s been almost three weeks since I got on a plane in the middle of the night to begin a tri-city tour of the lower 48. First stop was San Francisco. I did a miserable job of blogging while I was on the road. I know this is all about time management and my adversion to hand held devices. Today, I’m back at home in front of my desk top and ready to share some art adventures. My trip to San Francisco involved a quick and early–as in 4:30 in the morning–lay over in Seattle. We boarded the plane to SF only to be told that a broken part (doesn’t that sound a bit scary?) would be delaying our flight by four hours. It seems they needed to find a new part…which is equally scary sounding. I think my uneasiness about this came from the ambiguity of the announcement. Just exactly what part was broken was never revealed. A windshield wiper? the rear landing wheels? our flotation devises? I will never know. Two things happened at this juncture. I once again admitted to myself that I needed a cell phone. With a cell phone, I could quickly tell my San Francisco friend that I would be late. Instead, I had to trek the airport looking for a nearly extinct version of communication known as the public phone. In pursuit of this public phone, I walked by a piece of art. I thought to myself, “Gosh, that looks like a Stella but in pastels. Could it be?” Yep. It was a Frank Stella circa 1972. At that point, my public phone hunt took on a new dimension. SEATAC is full of art. You can even use your phone to be lead on an art tour. Yet another reason I should get a cell phone. And with four hours to spare, I had plenty of time to enjoy it. 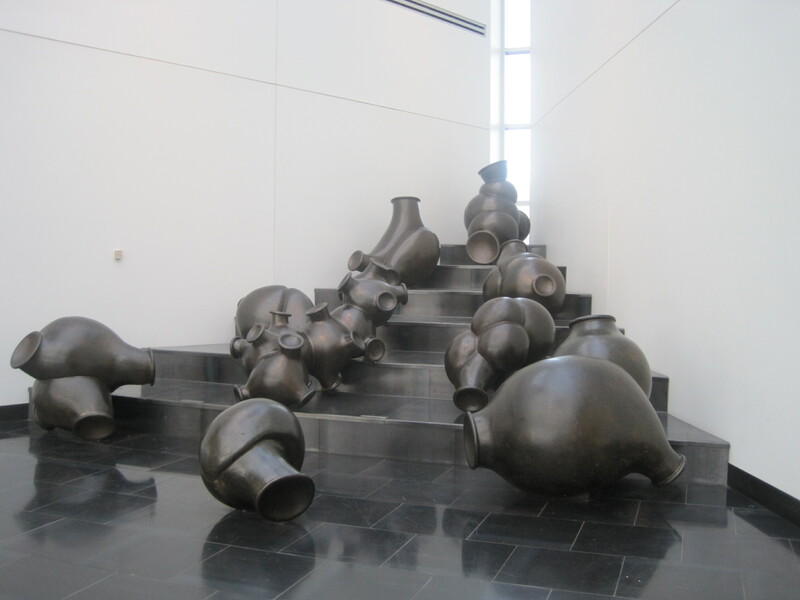 Next up was this wacky scupture–in the air and on the ground–by Peter Shelton called cloudsandclunkers. I spent a lot of time enjoying an area full of columns covered in mosaics. I failed to document the name of this piece. 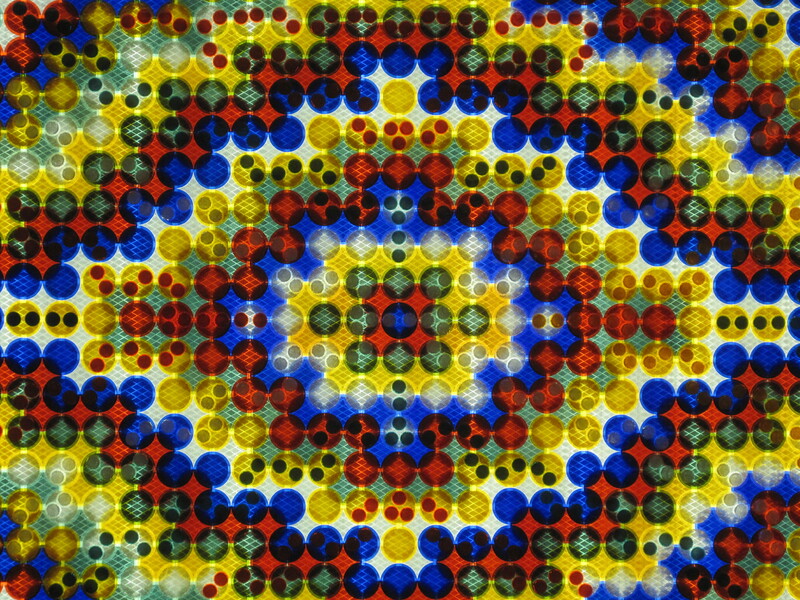 Patchwork and mosaics have a lot in common. That’s part of why I love this kind of work. Here is you get an idea of how large the columns are. Words telling you justhow big the Champion is. Detal shot of the Champion. Another view of Roaring–it is interesting that this is art in the round. 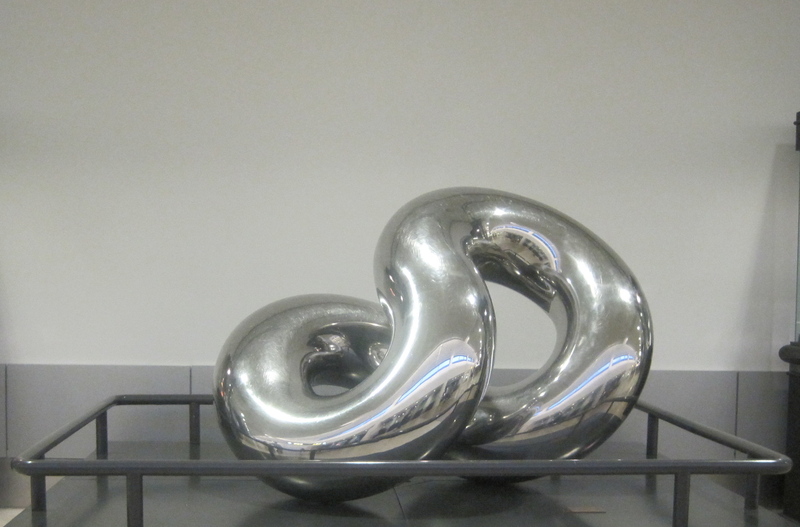 This sleethering smooth silver sculputure was also very pleasing to look at. It is PANTOPOL V by Ted Jonsson and was made in 1972. 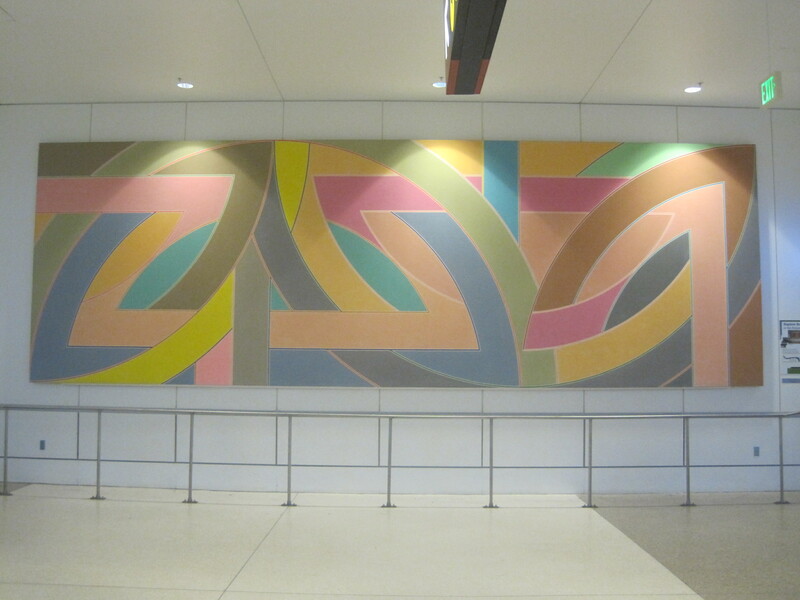 This piece, and the one by Stella from 1972 made me think–has the Seattle Airport always collected art? And if so, that is amazing. I concluded my tour with this piece called On: Matter, Monkeys and the King, March 2004 by Trimpin. 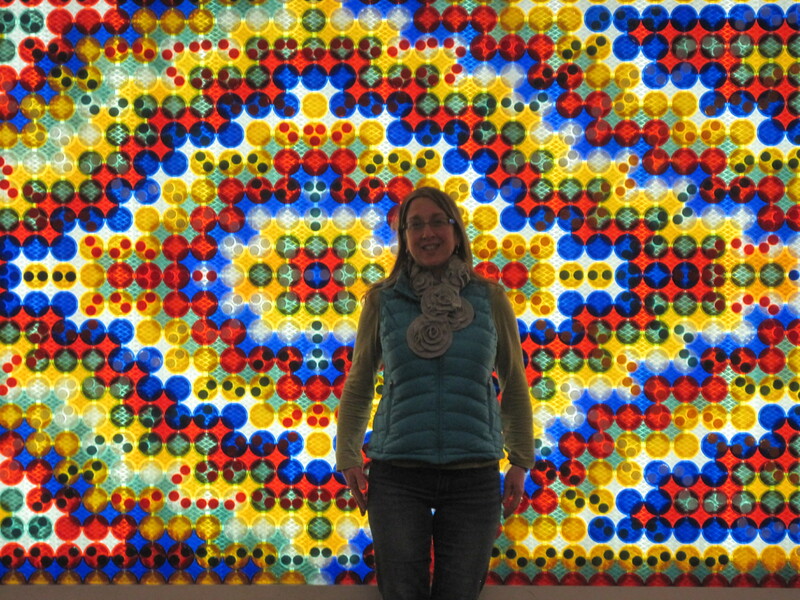 I hope you enjoyed this virtual tour of Seattle Airport Art. This is my favorite piece of Seattle Airport Art. It is down in the luggage pick up area, so I did not get to see it on this trip. I shamefully do not know the name of the piece or the artist. I did get to see the piece last fall when I visited Seattle for the Bellevue Arts Museum show High Fiber Diet. Over the next week or so, I will continue to chronical my trip. Next up is the Arc Gallery and Studios where I participated in my first ever artist talk. It is good to be home and enjoying a sub-arctic heatwave! 12 Jun	This entry was published on June 12, 2013 at 5:33 PM and is filed under Art in Place. Bookmark the permalink. Follow any comments here with the RSS feed for this post. 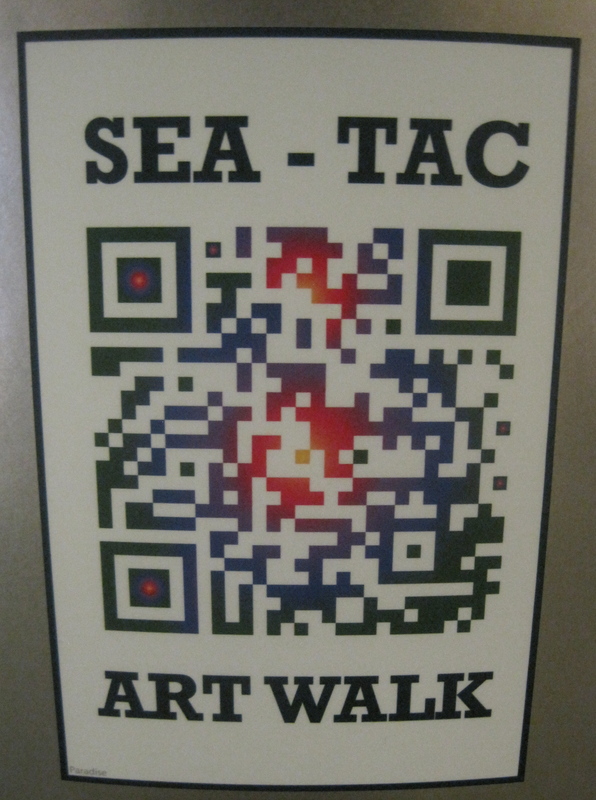 All public building projects in the Seattle area, by law, must commit 1% of the construction budget to public art. The “1% for Arts” program has been widely emulated around the country. As one of the oldest of such programs, local government agencies here have learned to hire project artists early on to work alongside project architects and engineers, creating well-integrated and site-specific art. 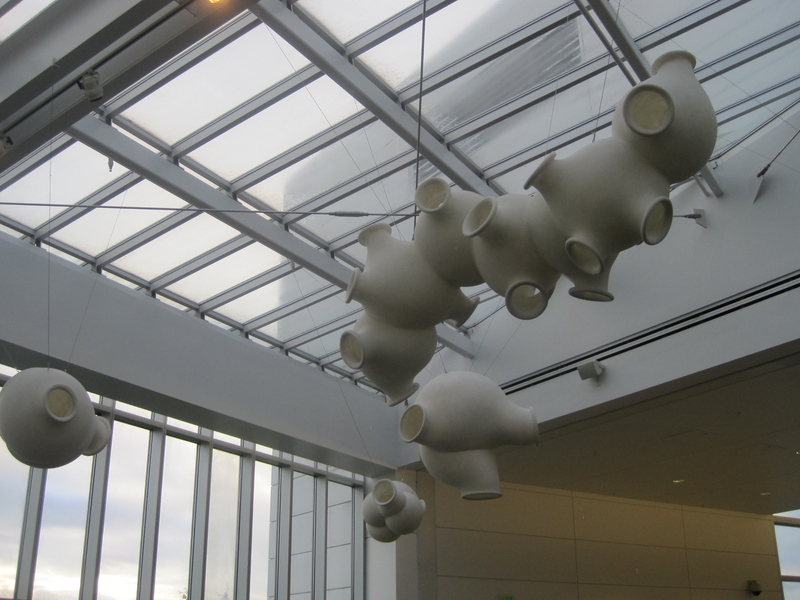 Public art is a matter of public record, so a quick Google search for “public art in SeaTac airport” should lead you to a well-notated gallery of all the works in the facility.